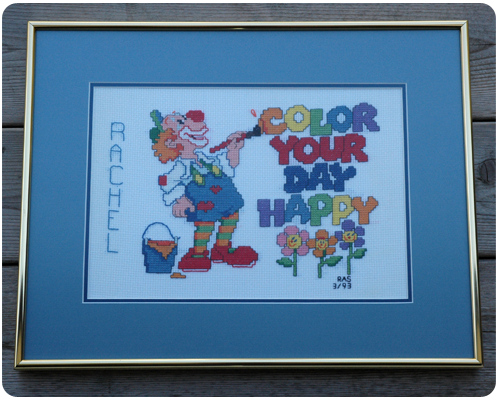 Prior to joining The Memory Nest Design Team I had never participated in a Color Challenge. Why, I am not sure, because they are so much fun! 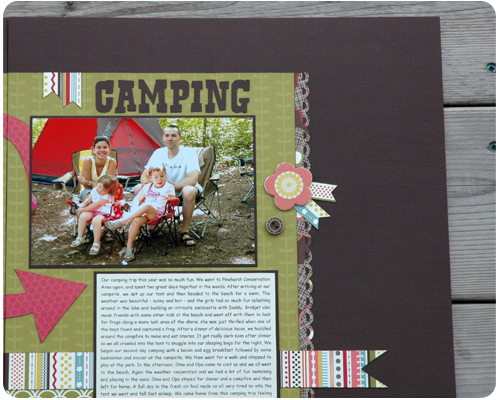 I love seeing the color grouping for the challenge and then hunting for the right papers to work with. And then there is selecting the right photos: I usually have my photos in hand first and then choose my papers to match, but a color challenge forces me to work the other way around, and I love the opportunity to stretch my creativity. If you haven't participated in a Color Challenge yet, might I suggest you do so. So much fun, and such a great way to get creative! 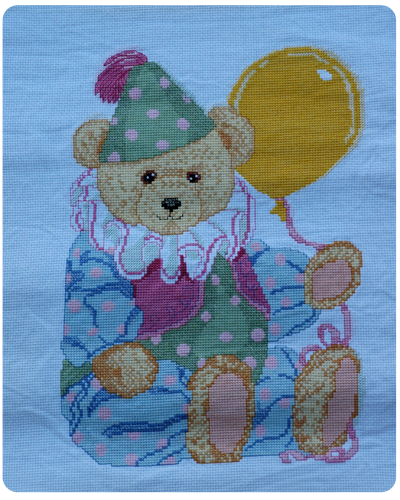 When I saw the colors to be used for this challenge I immediately thought of the Abode collection by American Crafts. I bought this paper a few years ago and it has been waiting patiently in my stash to be used. Since the patterned paper in this collection is so loud and busy, I used it in small quantities to make sure it did not overpower my photos. To help my photos 'pop' against the colorful background, I converted them to black and white. I also kept my embellishments to a minimum in order to keep the page clean and simple - a simple flower from Bazzill with a button in the center. As I do most of the time, I cut my title out using my Silhouette (font: Ravie). Have I mentioned how much I love that thing? 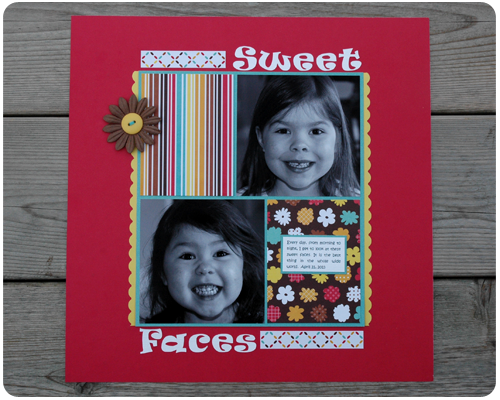 Head on over to The Memory Nest today to see how other people were inspired to create using this color grouping. So fun! This paper was so fun to work with - great colors, bold patterns. 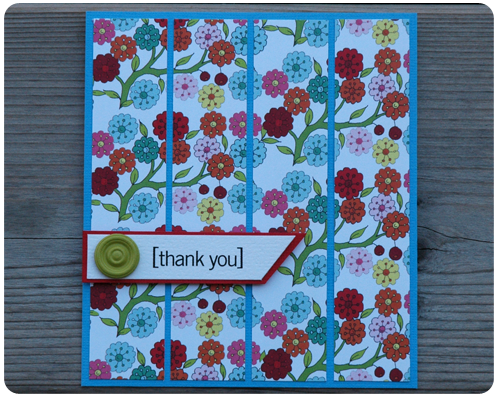 I was going to embellish these cards a bit more, but when I searched my stash I could not find anything that really worked. So I left them clean and simple, and just let the unusual patterns work together. Another great week designing for The Memory Nest! This week myself and the other members of the Design Team were working with Simply Spring by We R Memory Keepers. 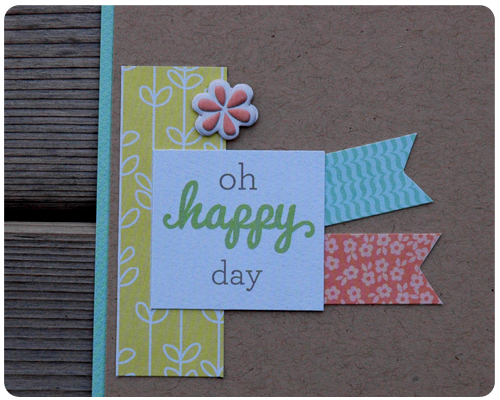 What a lovely line of paper, perfect for Spring and Easter layouts. 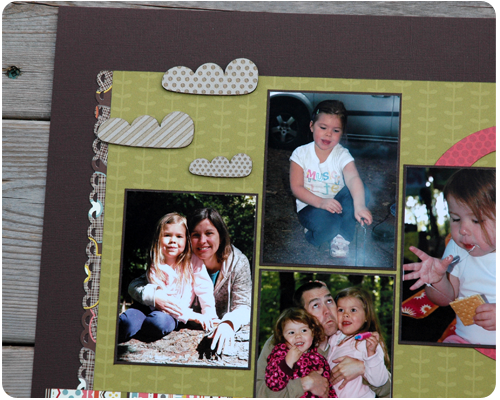 I used the perfectly coordinated cardstock (also by We R Memory Keepers) and the yellow and green patterned papers as the base for my page and then layered my pictures on top. I cut my title out using my trusty Silhouette (font: Segoe Print). 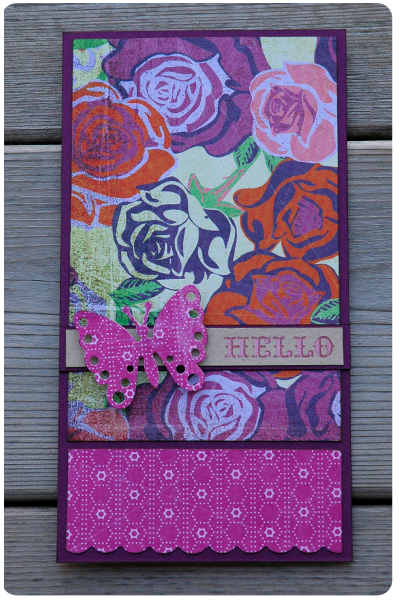 The butterfly and the branch are from the coordinating sticker sheet. This series of pictures was taken when we went to visit some family at their farm about an hour and a half away from home. The weather was so completely different there - warm and sunny compared to raining and cold at home. The girls were thrilled to run around in the sunshine, shouting and laughing. It was a fun day. 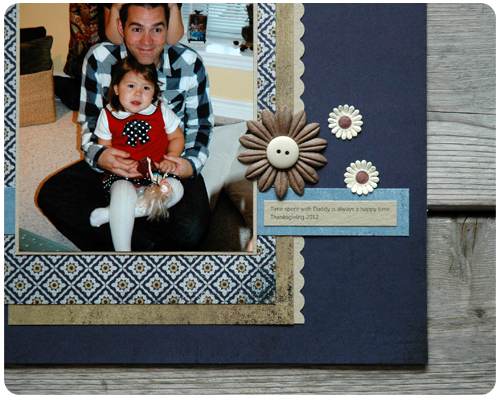 I used quite a few of the patterned papers on this layout, in small pieces to keep the focus on my pictures. In the top corner I made a little embellishment by layering patterned papers, a sticker, and a tag from the coordinating tag sheet. 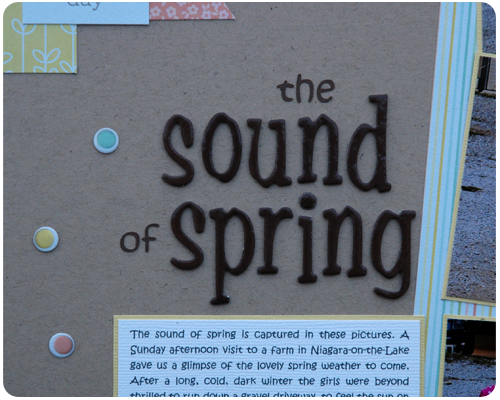 My title is a mix of Thickers (by American Crafts) and letters cut with my Silhouette (font: Kristin ITC). The small dots that are scattered across this page are from the coordinating sticker sheet. This is a lovely line of paper - so many possibilities for layouts and even cards. Yes, I can see a few cards in my future using this paper. 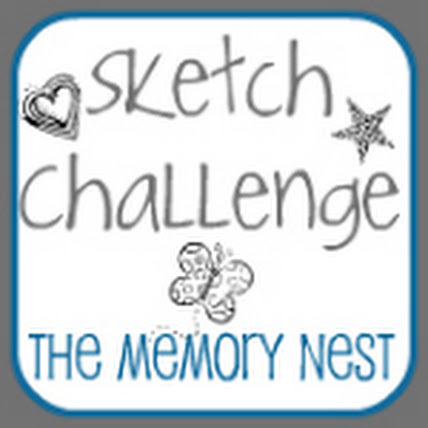 Please go and visit The Memory Nest to see what the other talented ladies of the Design Team have created. On Saturday it snowed. I had hoped that the weather would be pleasant enough to allow me to go outside and work in the garden, but no, the cold and the snow forced me to stay inside. So I spent part of the afternoon at my craft table, sipping a coffee and playing with some pretty flower paper. This paper is fairly busy, but rather than just put it on the front of the card in one piece (like I often do with busy paper - see here), I cut it in strips and then placed them on the front of the card slightly apart from each other. 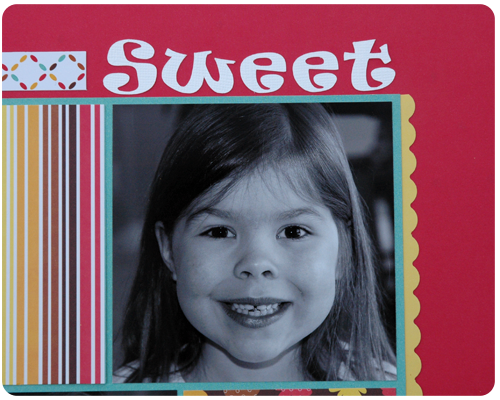 This is a technique that I saw used over at Paper Owl; Cassie is an amazing card designer and when I saw her card I knew I wanted to make my own. It was a bit painful to line everything up evenly, but worth it - I really like how my card looks. 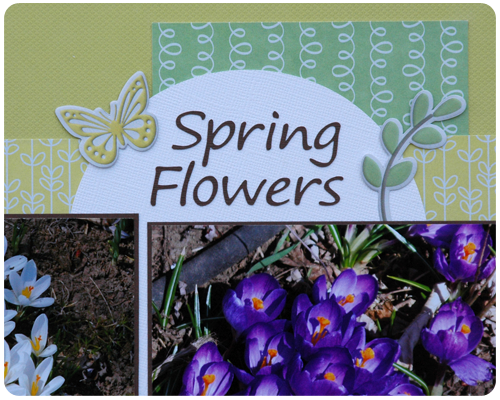 So still no flowers in the garden, but pretty flowers on the front of a card. Not a bad compromise. How was your weekend? Did you spend time crafting? As soon as I saw it I knew it would be perfect for the front of a card. 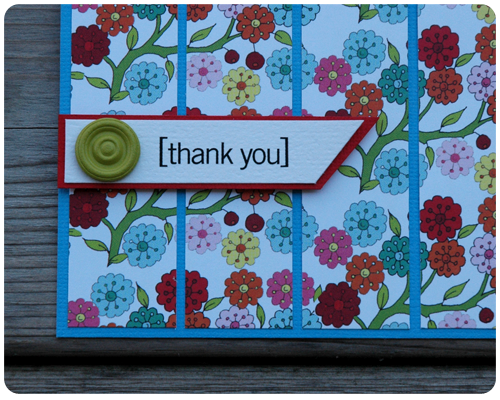 I think this card would work well for a birthday, a graduation, or to congratulate or encourage a friend. 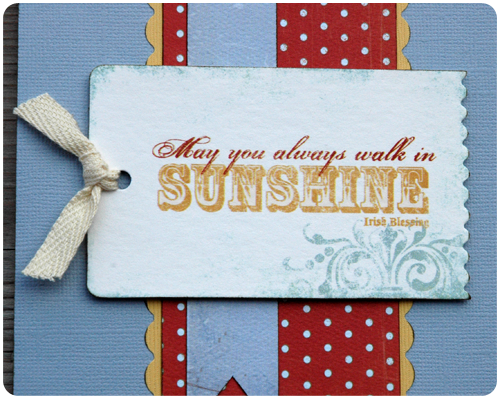 May you always walk in sunshine: a wish for any occasion. 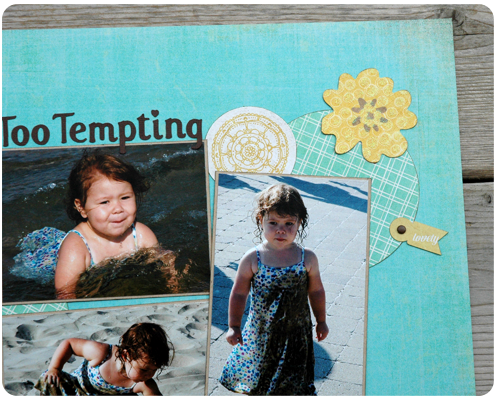 Today I would like to share with you another layout I did using a picture from the summer of 2012. 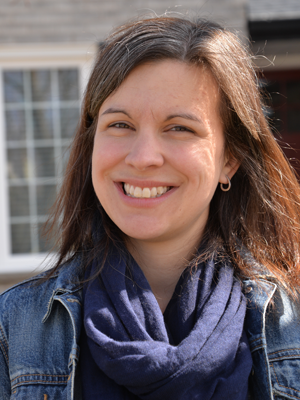 This picture was taken on Labor Day weekend, which we spent with my sister-in-law and her family at the lake. The weather was absolutely perfect and the girls had so much fun playing at the beach with their cousin. I pulled together supplies from many companies in making this page. 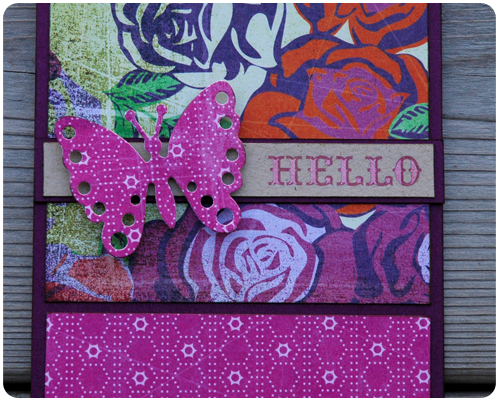 The patterned paper is from American Crafts and so is the swirly rub-on that is underneath the photo. I like how the "stitched" look of the rub-on ties into the style of writing on the title tag (by Stella Rose). I also used some of the chipboard clouds that I first used on my camping layout. I really like the whimsical patterns on these clouds and how they add some dimension to the page. To add some detail to this corner, I used some sunburst stickers from October Afternoon. 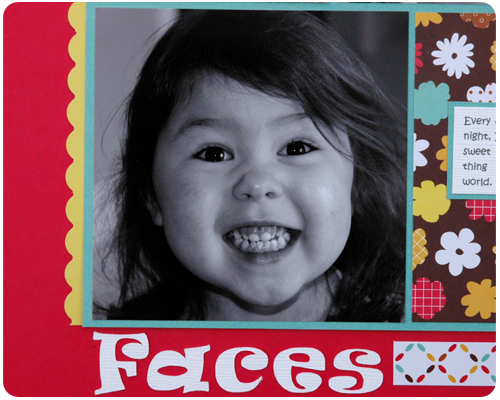 I also made my own photo corner which I embellished with a rub-on from Imaginisce. Anyone else want to go to the beach right now? When I am busy creating my craft table is a complete disaster. I like to refer to it as "organized chaos" because even though it may look like random piles all over the place, I know where things are and can easily find them. And sometimes, like this week, the mess works to my advantage. 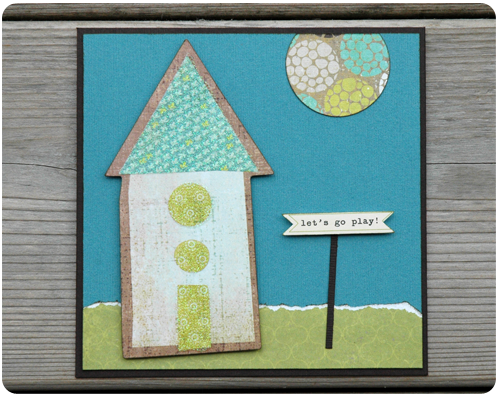 I first saw the die cut house lying on the table and thought it would look good on a card. 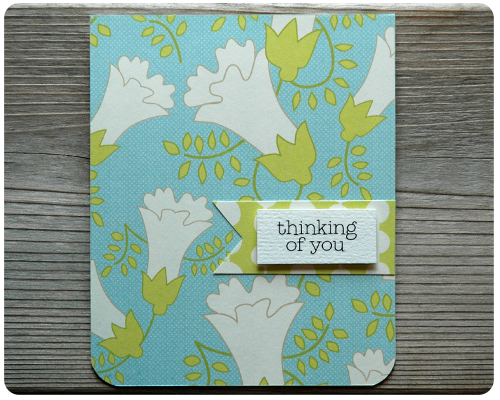 The turquoise cardstock was nearby and matched perfectly. Then I found some scraps of paper from last week's color challenge, which also coordinated well with what I was working on. 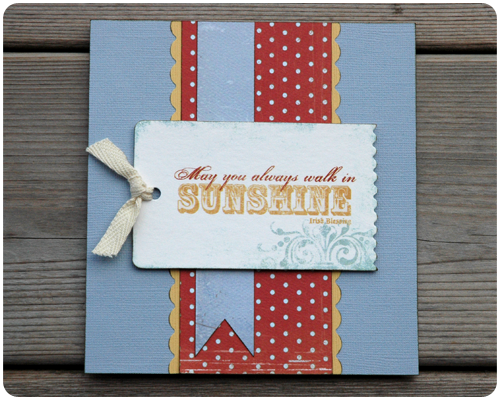 Add a little brown cardstock and a silly sentiment, and I was done. So you see, from the piles of supplies lying around on my craft table I was able to make something cute...which proves that creativity can arise from a mess and that the chaos that usually surrounds and covers my craft table is organized enough for me to work with. 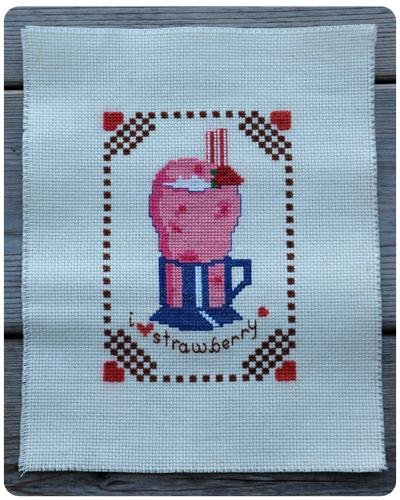 What have you made using the scraps and bits you have lying around on your craft table? I have been very busy lately trying to get all my pictures from last summer scrapped....you know, before this summer rolls around. 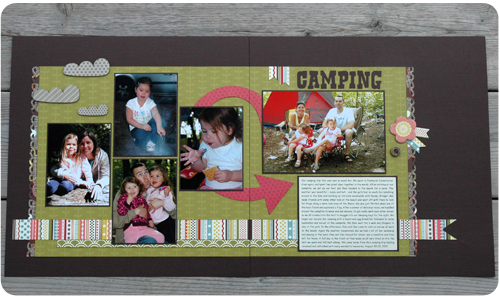 Using some incredible paper from Pebbles Inc. (the same paper I used to make these cards) I made this double layout using pictures from our family camping trip. When I create double layouts I almost always bring my patterned paper across both pages. For me, this works to visually connect the two sides together. 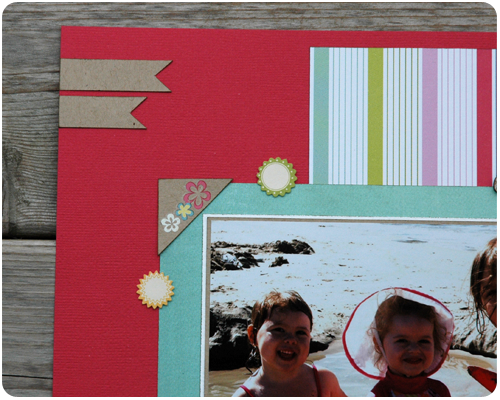 In this layout I not only carried the green background paper and the striped patterned paper across the pages, but I also added the red arrow (from Scenic Route). 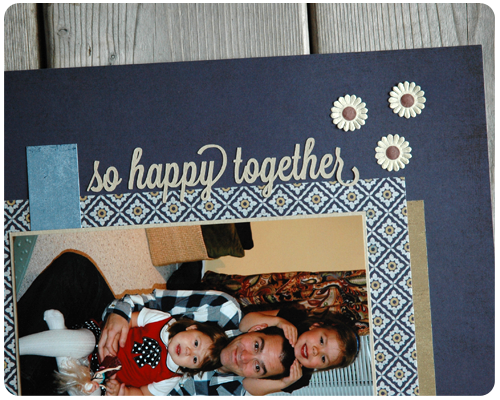 I kept the right side of my double layout simple - just a large family photo and a journalling block. 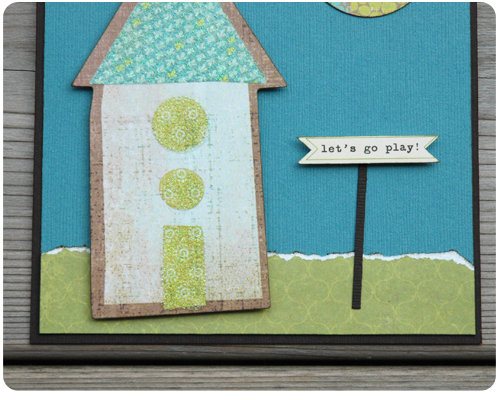 The flower embellishment is from Scenic Route and adds the perfect little detail. The left side of my layout is more photo heavy, but the photos are smaller. 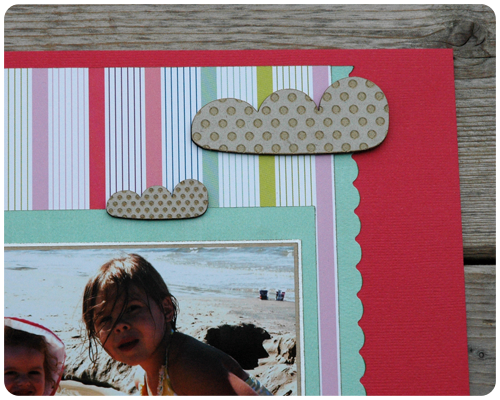 I love the little chipboard clouds that I added to the top corner. I bought these at the epic scrapbooking garage sale I keep mentioning. They were in a large bag of stuff so I am not sure who makes them (anyone know, because I would love to get more). 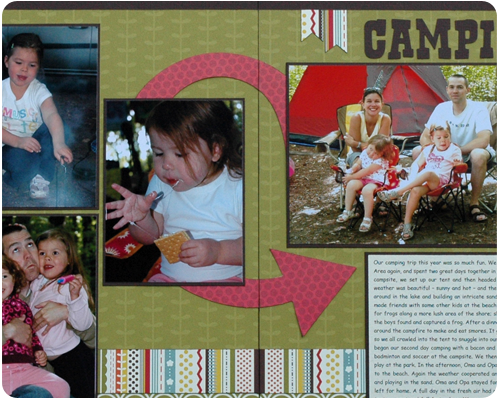 Relaxing at the campsite, the warm sunshine, roasting marshmallows, eating smores....these are the incredible memories of our camping trip that I am very glad I was able to record so beautifully on this layout. 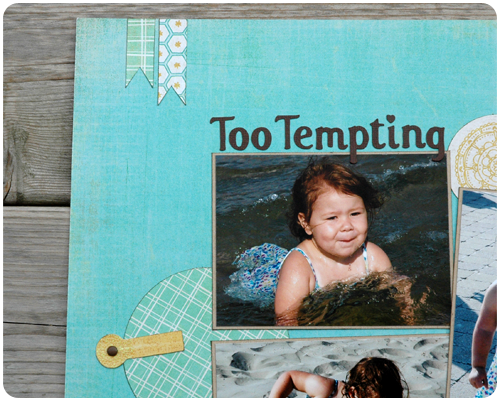 Have you got all your photos from last summer scrapped? 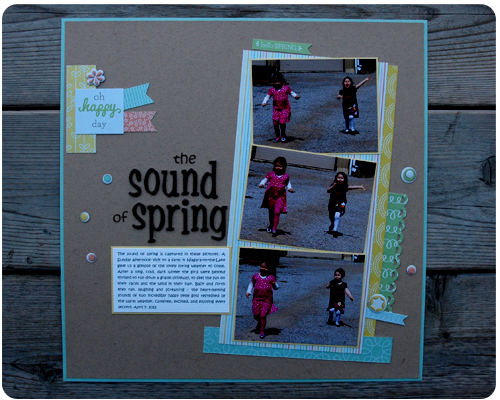 With this layout done, I only have two more to do..not too bad, and it is so much fun to look back at my pictures as I go and remember how much fun we all had. The signs of spring outside my window are quite mixed. The huge snow piles are melting and there is the constant sound of water dripping, but at the same time the robin I saw weeks ago has not made another appearance, and the other night there were snow flurries and I needed to scrape ice off the windshield before I drove home. 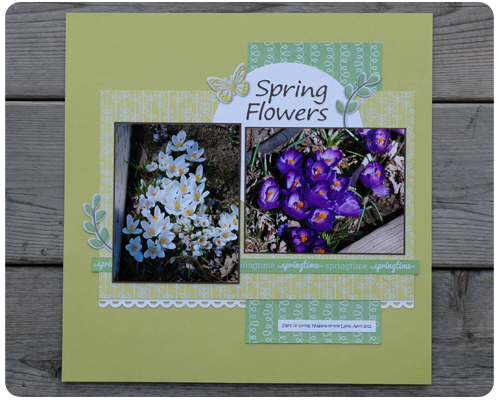 Until the outdoors gets itself sorted out, at least I have this lovely spring card propped up on my craft table. Now if only these flowers were blooming in the garden as well. Hope everyone had a lovely Easter.